Every day there are various manufacturing companies and service providers offering advertisements for new products or services. Many organizations are continually developing new products with the intent of breaking into new markets or gaining market share in existing ones. If the companies design, develop and produce a product or service that does not meet customer expectations, vast amounts of resources could be wasted. The question arises of how continuously successful organizations know what to develop and what the customer wants. These companies do their research and determine what the customer wants, needs and expects from their product or service by using Voice of Customer (VOC). Voice of the Customer (VOC) can be defined as the needs, wants and expectations of the customer, stated and unstated. This includes both external and internal customers. 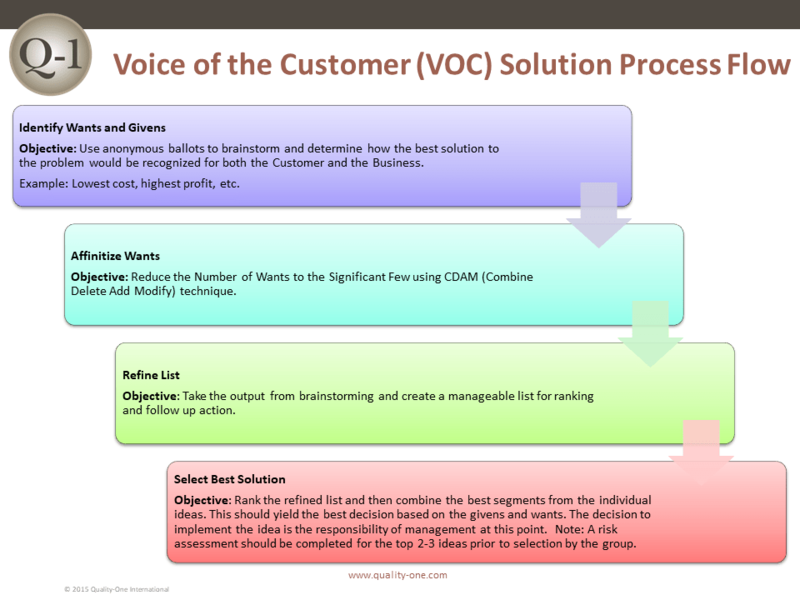 In addition, VOC is often viewed as a process or procedure for collecting, documenting and analyzing the feedback from the customer to improve a product or process. The VOC process should be proactive and continually refined to effectively capture constantly changing customer requirements. The process should also include methods for effectively sharing and utilizing this valuable information to effect meaningful change. Hear what your customer is trying to tell you. Know what your customers actually want instead of what you may believe they want. Respond to customer needs in a timely manner. By tracking trends in customer feedback you can anticipate changes, react quicker and bring new product to market sooner. Design and develop a product your customer wants and needs. Avoid costly design changes. Provide the level of quality service that your customer expects. Increase sales while also maximizing margins. By knowing the voice of the customer you can design and deliver what the customer wants, omitting what is not important to them and avoid over designing the product. There are various versions of VOC systems and software packages available and in use today within different organizations. The particular procedures and tools vary dependent upon the type of product or service offered and the market conditions. There are however some basic similarities within the different systems. The system should start with identifying who the customers are, the methods used to gather information, utilize it effectively and then maintain the system to keep on top of constantly changing customer requirements. The first step in any VOC process is to identify your customers. Many organizations concentrate entirely on the end user of the product and service and forget about other customers. Missed customers are missed opportunities. It is important to identify all your customers when designing and implementing a VOC system. Customers may be internal or external to the company. Who your internal customers are may depend on the type of organization and structure. Internal customers can be stakeholders or other leaders of the organization, the next step in a process or the associates working the particular process. The external customers consist of the dealers or end users of the product or service. The type of external customer can vary as well. External customers could be wholesale distributors, retail consumers or manufacturing companies. One important note; do not only consider your current customers, but also look to the future. Many New Product Introduction (NPI) projects purpose is to target new markets and new customers. When introducing new products it is vital that you properly study the demographics of your target market. The next step is to determine the methods used for collection and storage of the data and the proper sample size. Gathering data from an entire population of users or customers would be impractical. Therefore, a sample size must be determined that will accurately reflect the views of the population. Demographics – Determine the number of people that fit your demographic or target population. Demographics are the statistical characteristics of a particular group such as income level, age, or location such as rural vs. urban populations. Target markets or segments of the population are regularly established using demographic data. Confidence Interval – Also referred to as “Margin of Error”, this is a percentage that denotes how accurately the samples will be to the true value of the overall population. The general rule is that the smaller the margin of error the more accurate the results. Keep in mind that selecting smaller margins of error require larger sample sizes. Confidence Level – Quantifies the degree of certainty that the sample will represent the overall population within your selected confidence interval. For example, selecting a confidence level of 90% indicates that you are certain that 90% of the data will fall within the selected interval. The most common intervals used are 90%, 95% or 99%. Standard Deviation – The standard of deviation (sigma) indicates the amount of variation expected within a set of data. The exact value is difficult to define prior to collection of the data. Therefore, most often this value is initially set at 0.5. The majority of your data should fall between ± 3 standard deviations, or 3 sigma, from the mean. Z-Value – A constant value based on your confidence level. It indicates the number of standard deviations between any selected value and the average/mean of the population. The Z value can be manually calculated but most practitioners locate a table online. For a confidence level of 90 percent, the z value is >1.65. The proper sample size can now be determined based upon this information. Surveys – A survey is one of the most commonly used research tools for collecting data. A survey may be used to gather information or to obtain the customers impression / opinion of a particular product or service. Surveys may be in the form of a questionnaire that the participant fills out or a list of questions asked in an interview setting. Questionnaires are distributed via mailers or most often are performed online. Dealer Meetings – Some companies utilize a group of dealers to distribute their products, similar to the automotive industry. Dealers interact with customers on a daily basis. Regular dealer meetings are a prime opportunity to gather the Voice of the Customer. Dealer feedback can be a robust addition to your customer research. Focus Groups – Focus groups are generally small groups brought together to discuss or review a specific product or service. The members of the group are demographically diverse individuals meant to represent the views of the whole customer base. Focus groups encourage open discussion instead of individual responses to formal questions. The moderator documents the VOC information in the form of notes, audio recordings or video documentation. The risk involved with only using focus groups is that the data may consist of personal preferences or beliefs that may not represent the general population. Interviews – Interviews are a more direct and personal form of information gathering. There are two primary types of interviews commonly used. In the Personal Interview, the interviewer works directly with the respondent, and may ask follow-up questions and document their opinion or impression of the interviewee and the results. Another type is the Phone Interview, which allows for quicker information gathering than the personal interview. Telephone interviews allow for some personal interaction between the participants and may include follow-up questions. There are a few disadvantages to the interview process in general. Interviews require a large investment of time and resources. In addition, the accuracy and skills of the interviewer introduce additional variables that may affect the quality of the information. Once the data has been collected, consider what information you need to store and how often you need to back it up. In addition, assure that your system has adequate security measures to prevent hackers from breaking in and stealing any sensitive data. Furthermore, make sure that the archived data can be easily located. Establish clear guidelines for labeling, classifying, storage and access to your data. Now that the customer feedback has been collected and stored, a system is required to manage the complex data, set priorities and make accurate decisions based on the data. One very popular tool is the Analytical Hierarchy Process (AHP). A hierarchy is a method of arranging or classifying information or data relative to its importance or relevance. AHP is effective in addressing complex decisions involving the comparison of various elements that are difficult to quantify. Using the hierarchical approach we can structure the information by category and sub-categories wherein each element is compared by pairs and the criteria is weighted. The analytical hierarchy practitioner may also utilize a matrix to perform the pairwise comparison. The different factors are paired and weighted according to which of the two better meet the requirements or preference of the target market. By utilizing AHP to organize and prioritize the data, better decisions can be made based on the Voice of the Customer information. Upon collection and storage of the VOC data, the next step is to translate the customer wants and needs into product features and technical design specifications. One of the most effective methods for accomplishing this translation is with Quality Function Deployment (QFD). The House of Quality is usually the first matrix used in the QFD process, which demonstrates the relationship between the VOC “Whats” (customer wants and needs) and the “Hows” (design specifications) required to meet the customer’s needs. The matrix is data intensive and allows the team to translate and capture a large amount of information in one document. The matrix earned the name House of Quality due to its structure resembling that of a house. A cross-functional team possessing thorough knowledge of the product, the voice of the customer, and the company’s capabilities should complete the matrix. The QFD process allows for integration of the design specifications into the machine, system, sub-system and component level requirements. In addition, the design specifications are used to identify the key design and process characteristics, which are then monitored and controlled throughout the production and assembly processes. The design features and specifications derived from the VOC must be integrated into the entire organization to assure that the customer’s want and needs are being satisfied. Once the VOC process is established and integrated throughout the organization, the next step is to assure the information stays up to date and relevant to the customer’s continuously changing wants and needs. A system must be developed to regularly review and reassess your VOC data on an ongoing basis to ensure your service offerings continue to meet or exceed their requirements. There are several software packages on the market to manage VOC data or it may be done manually. It does not matter what method you choose to monitor and maintain your VOC library of data, the important thing is to make certain that the information is maintained properly. The fresher your information the more likely you are to keep abreast of your customers’ needs and possibly introduce a groundbreaking new product. The Voice of the Customer is the voice of success. Whether it is used for meeting a customer’s present or future need or resolving a quality issue, having accurate and up to date information leads to correct decision-making. Customers have a wide range of choices. The one they will likely choose is the one that meets or exceeds their wants and needs. At Quality-One, our experienced team of Subject Matter Experts (SME) can guide you down the correct path to developing an effective VOC process based on your organizational requirements. Quality-One offers VOC Consulting to assist in planning your VOC process, provide all required forms and templates as well as coach and mentor your team. We also deliver VOC Training, available onsite at your facility, offsite at one of our Technical Training Centers or online for a subject matter overview. We also provide VOC Support personnel that will work directly with your teams to develop and implement an effective VOC process. At Quality-One, our SMEs combine industry best practices and years of experience to address your needs and challenges, enabling you to accomplish your VOC goals. Quality-One offers Quality and Reliability Support for Product and Process Development through Consulting, Training and Project Support. Quality-One provides Knowledge, Guidance and Direction in Quality and Reliability activities, tailored to your unique wants, needs and desires. Let us help you Discover the Value of VOC Consulting, VOC Training or VOC Project Support.